VANCOUVER, BC--(Marketwired - March 30, 2017) - Midas Gold Corp. (TSX: MAX) (OTCQX: MDRPF) today announced the final results from its 2016-2017 mineral resource optimization drilling program at the Stibnite Gold Project, Idaho. The drilling program's objectives were designed to enhance the mineral resources defined in the December 2014 preliminary feasibility study ("PFS"), and the program has delivered overall positive results. Highlights for the last two holes in the program, completed at the Yellow Pine deposit, are reported below with complete results for the program tabulated at the end of this news release. (1) Gold composites are generated using a 0.5 g/t Au cutoff grade. Antimony composites are generated using a 0.1% Sb cutoff grade. Composites may include intervals below cutoff grades. (2) Gold equivalent grades are reported for illustrative purposes only and are calculated using metal prices of $1,200/oz Au, $17/oz Ag and $7,600/tonne Sb and do not include recovery, transportation, refining or payability. These factors will vary for each metal and affect the economic importance of the various metals. The winter drilling program consisted of fourteen HQ diameter oriented core holes totalling 2,224 meters (7,296 feet). Of these, thirteen holes were drilled in the Yellow Pine deposit area and one at Hanger Flats. Four holes contain significantly higher gold grades than predicted (by the PFS block model) and six holes contain moderately higher gold grades than predicted, and as previously announced, included the best hole ever reported by Midas Gold on the Stibnite Gold Project. In general, antimony grades in the central and southern portions of the Yellow Pine deposit exceeded expectations. "The mineral resource enhancement core drilling program, completed by our team between September 2016 and February 2017, has provided very encouraging results that support Midas Gold's goal of enhancing the mineral resources at the Stibnite Gold Project," said Stephen Quin, President & CEO of Midas Gold Corp. "These results will now be evaluated and, along with additional detailed geological and structural information collected from these and re-logged earlier holes, incorporated into an updated mineral resource for the Yellow Pine deposit in the coming months." 4. Advancing current prospects that carry no mineral resource at present towards defining mineral resources with the objective of increasing payable gold and Project NPV. The first two objectives were successfully met and the third and fourth objectives were only partially met as successful drill results in the earlier part of the drill program warranted additional focus in the areas beneath the former open pit at Yellow Pine. Additional drilling may be conducted at a later date to advance all of these objectives, including at the other deposits that comprise the Stibnite Gold Project. The two most recently completed holes, MGI-17-423 and MGI-17-424, the last holes of the winter program, were completed in the Central Yellow Pine area and the results are reported herein. MGI-17-423 was drilled adjacent to and sub-parallel to holes -414, -421, & -422 (the results for which were previously reported on November 30, 2016 and February 23, 2017), in a broad drill fan, oriented to the southwest to intersect west-northwest and east-west trending, northerly dipping silica-sulphide vein systems and silica-sulphide breccia's at angles appropriate to test true thickness and to validate legacy drill data. Hole MGI-17-423 intersected 194m averaging 2.46g/t Au, 6.3g/t Ag and 0.55% Sb, including 32m averaging 3.04g/t Au, 24.0 g/t Ag and 3.08% Sb. MGI-17-424 was located on a bench in the northwest portion of the historical open pit and was oriented to the southeast at a shallow angle to confirm and expand on gold and antimony mineralization under the historical open pit in an area with little modern era drilling data. The hole intersected 180m averaging 2.5g/t Au, 5.7 g/t Ag and 0.47% Sb. The intercept was slightly shorter, but slightly higher gold grade than the PFS mineral resource estimate. The broad zones of antimony-rich sheeted veins and breccias beneath the former open pit are continuous between holes completed in this program and provide increased confidence in controls on high grade mineralization. Holes MGI-16-418 and MGI-16-419 were drilled in the southeastern portion of the Yellow Pine deposit to follow up on two fences of successful 2012 and 2013 drill holes located to the northeast of 2016 holes MGI-16-418 and MGI-16-419 and successfully cut mineralization (the results of which were previously reported on February 23, 2017). MGI-16-418 returned approximately 30% higher gold grades over an approximately 15% longer width, but with slightly lower antimony grades than anticipated. MGI-16-419 returned gold grades twice those anticipated, but over 60% of the expected width. Two holes, MGI-16-415 and MGI-16-416, were completed in the Monday Tunnel area, located southwest of the southern rim of the former open pit (the results of which were previously reported on February 23, 2017), with MGI-16-415 successfully intersecting the target zone cutting substantially higher grade gold, antimony and silver than predicted from 1940s legacy underground drilling in the area, with the second hole terminated short of the target zone. Two holes, MGI-16-411 and MGI-16-412, both intersected significantly higher than anticipated grades as compared to the PFS mineral resource block model and extended a higher-grade trend approximately 100m northeast and remains open along strike (the results of which were previously reported on November 21, 2016). 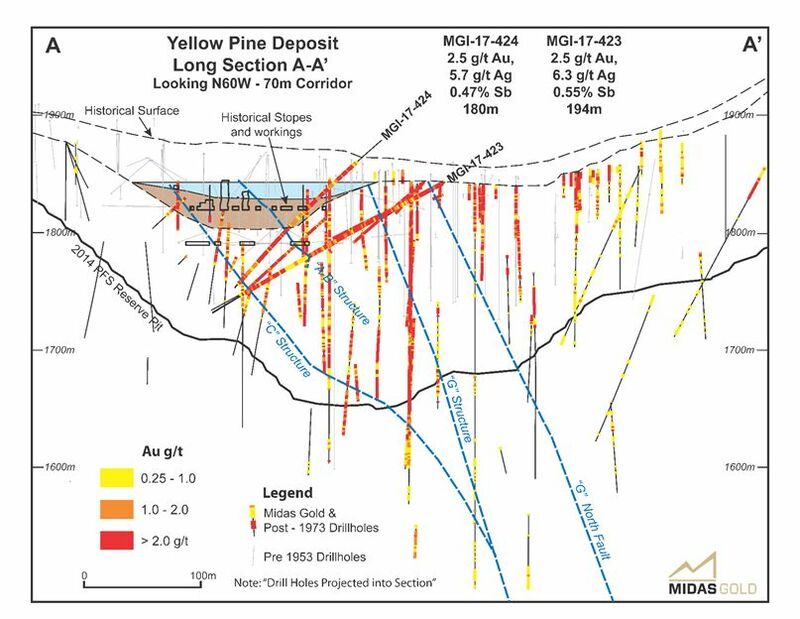 A single exploration hole, MGI-16-413, targeted shallower mineralization encountered in adjacent Midas Gold and legacy operator holes in metasediments adjacent to the Meadow Creek Fault Zone. As previously reported on November 21, 2016, this hole intersected quartz veining below the fault but only anomalous gold values were encountered. The complex interaction of structure and stratigraphy in this area make targeting challenging and the potential of this area will be re-evaluated in the future. 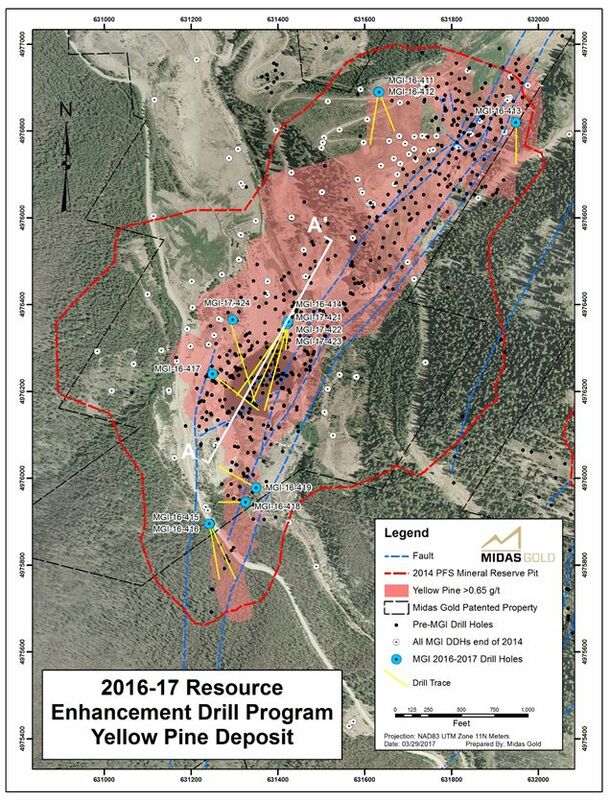 Hole MGI-16-420 targeted an area of inferred resources on the east flank of the Hangar Flats deposit away from the primary mineralizing structure, the Meadow Creek Fault Zone (the results of which were previously reported on February 23, 2017). The hole, although altered throughout, cut only low grade mineralization, below cut-off grade, averaging 0.21 g/t Au from the collar to the end of the hole. Details of the previous news releases, the Project and the 2014 PFS can be found filed under Midas Gold's profile on SEDAR (www.sedar.com) or at www.midasgoldcorp.com. To view a cross section and the locations of drill holes reported in this news release, please see figures accompanying this release. The technical information in this news release has been prepared in accordance with Canadian regulatory requirements set out in National Instrument 43-101 ("NI43-101") and reviewed and approved by Stephen P. Quin, P. Geo., President and CEO of Midas Gold Corp., and a Qualified Person. The exploration activities at the Stibnite Gold Project were carried out under the supervision of Richard Moses, C.P.G., Qualified Person and Field Operations Manager for the Stibnite Gold Project. T&J Enterprises, Inc. of Frenchtown MT was contracted for drilling utilizing an AR-65 core drill with HQ3 core with a diameter of 61.1 mm (2-1/2"). All holes, with the exception of one vertical hole, totaling 101.6 meters (333.3 feet), were drill oriented using an ACT III core orientation tool from International Directional Services; LLC of Chandler AZ. Drilling was conducted 24-hours/day using two shifts each with a 3-person crew (driller, drill helper, mud-man). Shifts were scheduled of 20 days on followed by 10 days off. Core was photographed in the core barrel split inner tube, marked for orientation and discontinuities measured at the drill site and then recovery and RQD were measured, and logged for rock lithology, alteration, mineralization, and structure. The core was boxed, photographed in the core box, with sample intervals selected on approximately 1.52 meter (5 foot) intervals, which were then marked for cutting and sampled. One half the core was collected for assay and the second half retained in the core box for archival purposes. All gold assays are by a 30g Fire Assay charge followed by an atomic absorption finish (with a 0.005g/t lower reporting limit). Samples reporting values > 6g/t gold are re-analyzed using a 30g Fire Assay charge followed by a gravimetric finish. Silver is analyzed via a 4-acid digestion followed by an ICP finish (with a 0.5g/t lower reporting limit). Samples reporting values > 10g/t silver are reanalyzed using a 50g Fire Assay charge followed by a gravimetric finish. Antimony is analyzed via a 4-Acid digestion with ICP finish with a 5g/t lower reporting limit. Samples reporting values >500g/t antimony are reanalyzed using XRF fusion. Some intervals may not add or subtract correctly due to rounding, but differences are deemed insignificant. Analyses are carried out by ALS Chemex in their Reno and Elko, Nevada and Vancouver, British Columbia laboratories. Umpire samples are routinely submitted to third party labs and blank and standard samples are inserted at appropriate intervals and used for quality assurance and quality control and a review of the results of analyses of the blanks, standards and duplicates by the Company's Qualified Person indicates values are within normal and acceptable ranges. Statements contained in this news release that are not historical facts are "forward-looking information" or "forward-looking statements" (collectively, "Forward-Looking Information") within the meaning of applicable Canadian securities legislation and the United States Private Securities Litigation Reform Act of 1995. Forward Looking Information includes, but is not limited to, disclosure regarding possible events, conditions or financial performance that is based on assumptions about future economic conditions and courses of action including actions taken with the goal of improving, expanding and de-risking previously defined mineral resources; the timing and availability of future drill results; potential sites for additional drilling that could result in potential improved confidence, enhanced economic returns and/or extending higher grade areas. In certain cases, Forward-Looking Information can be identified by the use of words and phrases such as "plans", "expects" or "does not expect", "is expected", "estimates", "forecasts", "intends", "anticipates", "potential", "confirm" or "does not anticipate", "believes", "contemplates", "recommends" or variations of such words and phrases or statements that certain actions, events or results "may", "could", "would", "might" "be achieved". In preparing the Forward-Looking Information in this news release, the Corporation has applied several material assumptions, including, but not limited to, that pending drill results will be available in a timely manner without undue delay; that areas identified as potential sites for additional drilling will yield results consistent with management's expectations based on the PFS; any additional financing needed will be available on reasonable terms; the exchange rates for the U.S. and Canadian currencies will be consistent with the Corporation's expectations; that the current objectives concerning the Stibnite Gold Project can be achieved and that its other corporate activities will proceed as expected; that the current price and demand for gold will be sustained or will improve; that general business and economic conditions will not change in a materially adverse manner and that all necessary governmental approvals for the planned activities on the Stibnite Gold Project will be obtained in a timely manner and on acceptable terms; the continuity of the price of gold and other metals, economic and political conditions and operations. Forward-Looking Information involves known and unknown risks, uncertainties and other factors which may cause the actual results, performance, or achievements of the Corporation to be materially different from any future results, performance or achievements expressed or implied by the Forward-Looking Information. Such risks and other factors include, among others, the industry-wide risks and project-specific risks identified in the PFS and summarized above; risks related to the availability of financing on commercially reasonable terms; operations and contractual obligations; changes in exploration programs based upon results of exploration, including drill results; changes in estimated mineral reserves or mineral resources; future prices of metals; availability of third party contractors; availability of equipment; failure of equipment to operate as anticipated; accidents, effects of weather and other natural phenomena and other risks associated with the mineral exploration industry; environmental risks, including environmental matters under US federal and Idaho rules and regulations; impact of environmental remediation requirements and the terms of existing and potential consent decrees on the Corporation's planned exploration and development activities on the Stibnite Gold Project; certainty of mineral title; community relations; delays in obtaining governmental approvals or financing; fluctuations in mineral prices; the Corporation's dependence on one mineral project; the nature of mineral exploration and mining and the uncertain commercial viability of certain mineral deposits; the Corporation's lack of operating revenues; governmental regulations and the ability to obtain necessary licenses and permits; risks related to mineral properties being subject to prior unregistered agreements, transfers or claims and other defects in title; currency fluctuations; changes in environmental laws and regulations and changes in the application of standards pursuant to existing laws and regulations which may increase costs of doing business and restrict operations; risks related to dependence on key personnel; and estimates used in financial statements proving to be incorrect; as well as those factors discussed in the Corporation's public disclosure record. Although the Corporation has attempted to identify important factors that could affect the Corporation and may cause actual actions, events or results to differ materially from those described in Forward-Looking Information, there may be other factors that cause actions, events or results not to be as anticipated, estimated or intended. There can be no assurance that Forward-Looking Information will prove to be accurate, as actual results and future events could differ materially from those anticipated in such statements. Accordingly, readers should not place undue reliance on Forward-Looking Information. Except as required by law, the Corporation does not assume any obligation to release publicly any revisions to Forward-Looking Information contained in this news release to reflect events or circumstances after the date hereof or to reflect the occurrence of unanticipated events. (3) All holes are core holes.